Having a web presence for your business is extremely important these days. Thankfully, you don’t have to spend and arm and a leg to get a great looking site any more. Today, sites like ThemeForest are making the web development process painless and affordable for business owners and bloggers alike. ThemeForest, sometimes called Theme Forest, is a marketplace where developers and designers can gather to sell their products. Specializing in HTML, WordPress, Drupal, Joomla, and Bootstrap themes and templates, ThemeForest has a lot to offer. 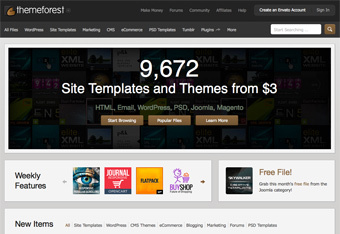 In fact, they currently offer almost 11,000 individual themes and site templates! ThemeForest has content to suite all niches, but there is a large concentration of restaurant-themed content. At ThemeForest you will find a lot of WordPress restaurant themes, Joomla restaurant templates, HTML restaurant templates, Drupal restaurant themes, and Bootstrap restaurant templates. Since there is a large demand for these products from the restaurant industry, you will find a ton of these types of items on ThemeForest. Since ThemeForest is a marketplace and not an actual developer, you can find a lot of different styles on this site. There are a ton of developers competing for business, which keeps prices low and quality high. Most of the themes sold on ThemeForest have excellent functionality and great designs, and it’s easy to spot the ones that don’t. So whether you’re looking for a nice WordPress restaurant theme for your new business, or a simple HTML template for your new blog, you’re sure to find what you’re looking for at ThemeForest! And if you run into any issues, you can get support directly from the theme developer. If you have any issues with ThemeForest itself (i.e. problems making purchases, site loading issues, etc) then you can contact the ThemeForest support team directly.